Robert Charles Photography used LexJet Print-N-Stick Fabric to make their anti-bullying statement. Edward and Robert Zemba, brothers and owners of Robert Charles Photography in East Longmeadow, Mass., know what bullying looks like. They both saw it firsthand growing up. Now, with children of their own and many high school senior clients who visit their studio, they felt compelled to partner with those students to launch the anti-bullying campaign, UNIFY, Unique iNdividuals Inspiring Future Youth. The program included a fashion show held in late April with a variety of high school-aged children of various backgrounds, shapes, ethnicities and physical abilities making their way down the runway. The event, sponsored by dozens of local companies and attended by more than 400 people, raised funds to support anti-bullying efforts and educational programs at area schools. During a performance at the fashion show and in the video, which focuses on name-calling and “labeling,” the Zembas printed various words on LexJet Print-N-Stick Fabric, a removable self-adhesive product. The words were stuck on and later removed from one of the kids to emphasize using positive labels rather than hurtful ones. 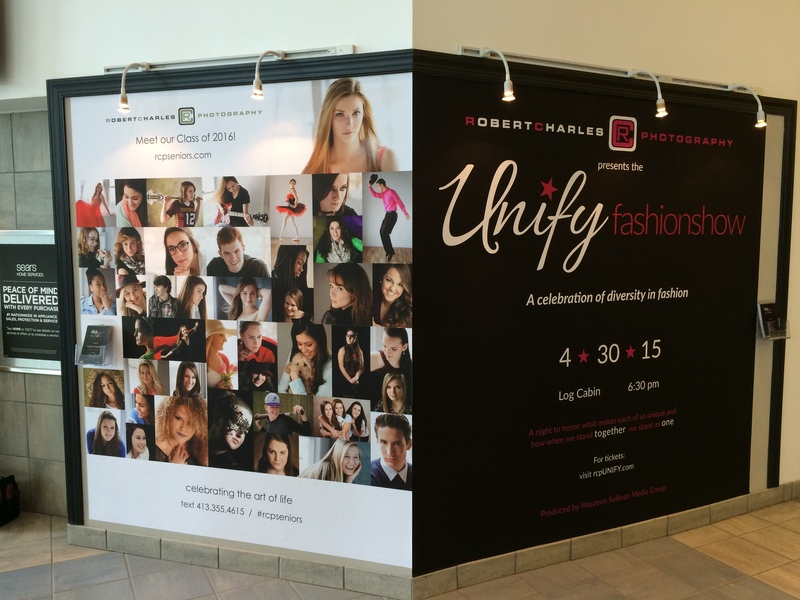 Prior to the event, the Zembas created an 80-inch-by-100-inch wall display, also printed on Print-N-Stick, that was installed at Enfield Square Mall. The display, pictured at left, was made up of four 42-inch wide images that were printed on an Epson Stylus Pro 9900 44-inch printer, a recent addition to the Robert Charles Photography studio, purchased from LexJet. The addition of the large-format Epson printer, Robert says, has provided increased flexibility to do more in-house printing. “To be able to print 44 inches wide is a game changer for us,” he says. The UNIFY video and program have received attention across the country, the Zembas say, and they’re working on spreading the message further and planning the 2016 fashion show event.